You have probably figured it out by now, but Kale is all the rage these days. It’s as trendy as skinny jeans. It’s all over at the farmers markets, in grocery stores, and in restaurants. And not without good reason. Kale packs quite a nutrition punch. It’s loaded with vitamin K, A, and C and chock full of a variety of minerals, antioxidants and fiber. Other health properties are it’s anti-inflammatory effects on the body and cancer-preventive glucosinolate compounds. So, if I haven’t convinced you yet, you should be eating this stuff! The next question is...how? Kale can have quite bitter flavors and may taste less than appealing to the average crowd. Adding a bit of lemon or vinegar to sautéed kale can combat some of the bitter qualities, but for some people that is not enough. I started experimenting with different ways of using kale so I could come up with something that everyone would enjoy! Below are two different ways of preparing kale that will knock anyone’s socks off. The finished pesto sauce...looks good, right? I tossed the pesto with some homemade gnocchi and sundried tomatoes- Delish! If you haven’t tried Kale chips yet you are missing out. 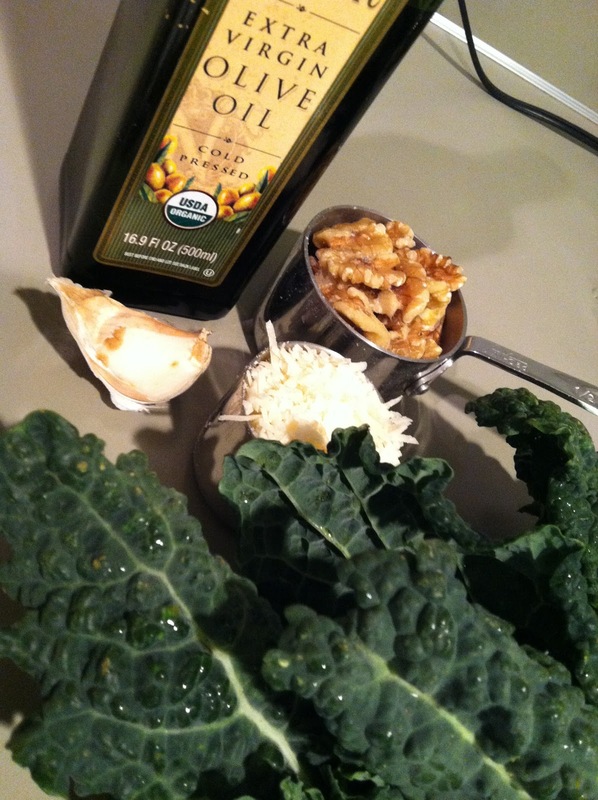 They are crunchy and flavorful…you could eat a whole head of kale! Throw all that in the food processor until it makes a creamy sauce. Wash and trim the stems off of a bunch of kale. (You can use any kind you like; there are so many varieties!) Tear or cut leaves into smaller pieces. Dip the kale leaves into the sauce, and place onto cookie sheets. Bake at the lowest setting on your oven for 2-3 hours until crispy! Yum! Wow Sarah! I can think of a lot of delicious things to do with kale, but I think you really hit the target here! YUM! I'm going to try both recipes this week! Sarah Seppa is a newly registered dietitian. With a background in whole foods based nutrition. Her specialites include family nutrition and sports. enjoy :: where did you go!